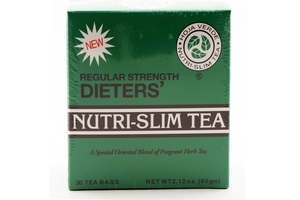 Hoja Verde Nutri-Slim Extra Strenght Dieters Tea in (2.1oz/30 Bags) (60g) Box. All Natural Special Oriental Blend of Fragrance Herb Tea. Nutri slim tea contain no chemical additive, no caffeine. For those who like to stay trim, try this ultimate herbal tea. Relax and enjoy the experience of being slim. Drink twice daily for maximum result. Product of USA. 減肥茶, 瘦身茶. [6 units] Limit 4 per customer! Malva Verticellatta (Chinese High Mallow), All Natural Oriental Herb Product.